ILDEX Vietnam 2016 breaks the record! This year the number of exhibitors has increased by 25% up to 205 exhibitors from 30 countries, and more than 7,328 visitors have guaranteed that the exhibition has become a real marketplace. Ho Chi Minh City, 25 March 2016 – 205 exhibitors from 30 countries came to meet with 7,328 trade buyers at the 6th edition of ILDEX Vietnam 2016. Compared to the last edition 2014, this is a tremendous growth of about 33% for visitor attendance, and it shows that the Vietnamese livestock and aquaculture industry continues to grow, as an important element of the human food chain being. Vietnam’s animal feed market demand was 15,829.3 kilotons in 2014 and is expected to grow at a CAGR of 6.4 percent from 2015 to 2022.Vietnam’s animal feed market is characterized by a high number of imports. Vietnam has become a production hub of ASEAN. A lot of cash has been spent during the exhibition. More than 200 exclusive buyers from all over ASEAN have participated in a lot of business matching sessions during the 3 days of the exhibition. Mr. Paolo Pandolfi from AZA International (ITALY) said, “I think that the Vietnamese market is one of the biggest in the pig sector. The mechanization makes progress, but still far from other countries like Thailand, for example. So most of the farms must be renovated and this is a great chance for us”. That’s why ILDEX Vietnam is an outstanding exhibition for all who attend the show. It’s a real marketplace for exhibitors, associations, buyers and visitors. Special thanks to the strong support from the Ministry of Agriculture and Rural Development of Vietnam (MARD), U.S. Consulate General, Consulate General of the Netherlands, Business France and South Korea who supported the country pavilions and to VIV Asia, Nong Lam University, the media, and top exhibitors who continuously support the conference program for all delegates. The 6th year of ILDEX Vietnam was another fantastic year. See you again in two years. ILDEX Vietnam 2018 will take place on March 14-16 2018 at Saigon Exhibition and Convention Center (SECC), in Ho Chi Minh City with the most effectiveness Livestock International platform in Vietnam. Lots of trade visitors have visited ILDEX Vietnam to guarantee that this is the best livestock platform that cannot be miss! The second day of ILDEX Vietnam was energetic with crowds of trade visitors and buyers. More than 5,200 people joined our exhibition in 2 days, especially from Vietnam and ASEAN countries. Our top profile exhibitors are pleased to welcome you, make a business matching and get the best solution for your business. For example; Famsun (Muyang) which is the first-time exhibitor in Vietnam presents the Animal Farming system. Big Dutchman is ready to welcome you with its gigantic booth with more attractions and Touch and Feel concept. Biomin is continuously participates and welcomes Sanphar Vietnam which is the sister company who has entered a five-year agreement with Nong Lam University. De Heus, the worldwide leading Animal Nutrition Company is ready to share knowledge, Innovation and quality with any customers. And there are more than 205 exhibitors who come with new technologies, innovations and alternatives choices to the industry to leverage its productivity. Tomorrow is the last day and the last chance to meet our livestock companies and professionals. 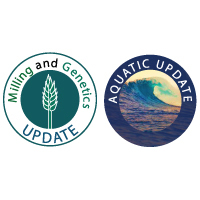 Milling and Pig Genetic Update Conference Time: 10.00 – 12.00 hrs. The Aquatic Review Conference Time: 13.30 – 15.30 hrs. The onsite registration opens at 9.00 hrs. See you tomorrow at ILDEX Vietnam!! Ho Chi Minh City, Vietnam, 23rd March 2016 – ILDEX Vietnam 2016, the 6th International Livestock, Dairy, Meat Processing, and Aquaculture Exposition, opened this morning with strong attendance and promising business opportunities. Livestock experts and exhibitors confirm that this is the best international business platform for the Vietnamese market. “For the first day we welcome more than 2,700 trade visitors and we expect that trade buyers will be 80% Vietnamese and 20% international. We have 205 top exhibitors and more than 30 companies that join ILDEX Vietnam 2016 as their first time entering the Vietnamese market. The highlight of this year is 3 major country pavilions from the United States, France, and South Korea, which bring new-to-market exhibitors from their countries. This event presents a great opportunity for livestock professionals to learn about new technologies presented by international experts in each country pavilion. We also have strong support from MARD and Nong Lam University. The exhibition covers the sectors of feed additives, equipment, animal health, genetic breeding, and meat processing. We have also invited key buyers from CLMV (Cambodia, Laos, Myanmar and Vietnam) to attend ILDEX Vietnam 2016,” explained Mr. Chinakit Viphavakit, Senior Project Manager of VNU Exhibitions Asia Pacific. http://www.ildex-vietnam.com/wp-content/uploads/2016/03/unnamed.png 61 261 Admin http://www.ildex-vietnam.com/wp-content/uploads/2015/12/logo_small_wide-300x81.jpg Admin2016-03-16 17:56:482016-03-16 17:56:48Bringing International Expertise to the "Dairy Industry in Dairy Connect Vietnam conference"
Faculty of Animal Science and Veterinary Medicine belonged to Nong Lam University in Ho Chi Minh City, does not only supply training mission for BS of animal science, Doctor of veterinary medicine, master and Ph.D. program in the field of animal science or veterinary medicine, but has also conducted the research work, transfer of science technology to related producers throughout the country. Making of this direction and going together with ILDEX Vietnam for years, in this seminar, the teaching staff of the Faculty look forward to referring to the most issues from livestock production through the reports concerning the feed quality in general or in advanced topics such as the risk of mycotoxin and also those very practical issues related to real production in Vietnam as reporting on “evaluation of metabolisable energy of common feed ingredients for broiler duck” or a report about breeding selection could be needed to concern. 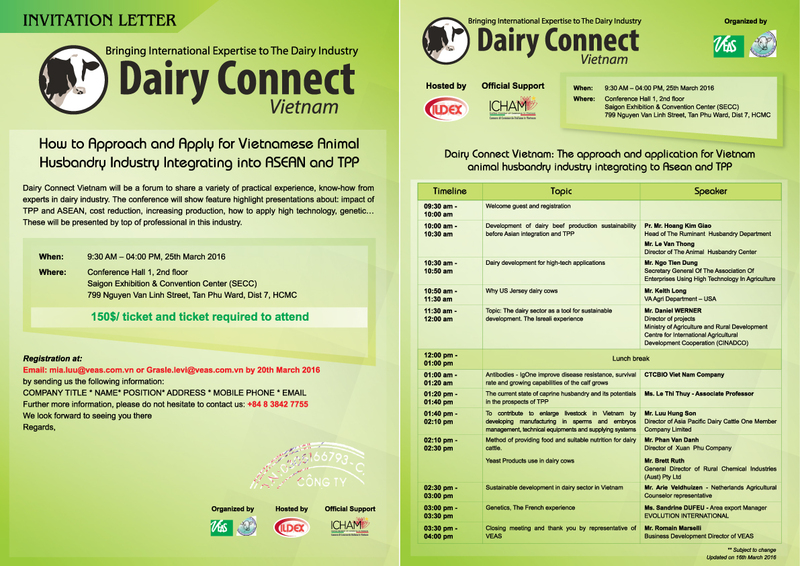 In another hand, some reports in this seminar will mention on very current issues about veterinary practice in Vietnam as the occurring of Balantidium coli, spreading fungal infection in poultry production as well as issues related to usage of antibiotics in livestock which had been interested in throughout the world as well as in Vietnam. Ho Chi Minh City, Vietnam, 23rd March 2016 – ILDEX Vietnam 2016, the 6th International Livestock and Dairy Meat Processing, and Aquaculture Exposition, Vietnam starts with strong attendance and business opportunities. Livestock experts and exhibitors confirmed that this is the best market place and international business platform for Vietnamese markets. Vietnam is one of the fastest growing economies in the world. Population growth, changing dietary habits and rising income result in a dramatic increase in meat consumption in Vietnam. Apart of the government has set up long-term plans and has given full support on the improvement of production and export of agricultural and livestock products. Experts forecast that year 2016 is the important year for the international economics of Vietnam because of the benefit from ASEAN Economic Community (AEC) opened. ASEAN economies are estimated to see a 5.3% increase in their real income thanks to their participation in the AEC. The Economic experts stressed that proactive participation in the AEC will bring great opportunities for Vietnam including faster economic growth, better job generation and additional foreign direct investment (FDI) inflows. For the aquaculture industry, and in the next three years, as China’s expanding population will demand nearly all of the world’s aquaculture production, Vietnamese fish farms will have an excellent opportunity as well. ILDEX Vietnam ready to drive Vietnam Livestock industry in a part of stimulate more investment, more new business and continue to support existing players to grow up better compare to previous year and provide the platform for international expertise to meet with local expectation. It is the time to analysis your business to find the new challenge and meets your new clients and right buyers, open new opportunities and completely business matching all in this business platform during ILDEX Vietnam 2016. Apart of the Opening Ceremony, Representative of Ministry of Agriculture and Rural Development of Vietnam (MARD), Ministry of Trade and Industry of Vietnam, VIP guests from the United States, France, South Korea and Netherlands gave the opening speeches and made the official opening together with management from VNU Exhibitions Asia Pacific, organizer. “In this year, visitors expects to be 80% from local and 20% from International with total estimation of 7,000 trade buyers. We have 205 top exhibitors and More than 30 companies paraded to join ILDEX Vietnam as their first time penetration in Vietnam market. The highlight of this year are 3 country pavilions of The United States, France and South Korea which bring some of new exhibitors from their countries to exhibit here. Strong support from MARD and Nong Lam University continuously. This is the good opportunities for livestock people to update about the new technologies with international experts in each pavilions. Apart of exhibition, the show consists of Feed additives, Equipment, Animal health & Genetic breeding, Processing sectors. An effectiveness platform to be connected with CLMV (Cambodia, Laos, Myanmar and Vietnam). Key Buyers from CLMV also be invited by the organizer to ILDEX Vietnam 2016” said by Mr. Chinakit Viphavakit, Senior Project Manager of VNU Exhibitions Asia Pacific. The 6th of ILDEX Vietnam ready for the another fantastic year and gearing up with lots of new campaigns to make the show even better one to include many interesting seminar program for all delegates such as VIV Master Class Interactive Program by VIV Asia in concept Today’s inspiration for tomorrow implementation, updates the knowledge on the fish’s disease and innovative technology on the improvement of the fish industry during Aquaculture Symposium by FAVA, A Comprehensive Approach to Immune Modulation in Poultry & Swine Nutrition by ICC, Farm & Veterinary sector, by Nong Lam University, Global Milling Conference by Perendale and How to develop Dairy in South East Asia forum by leading companies and related association in order to leverage Dairy Industry to be ready for becoming AEC. Over than 1,000 livestock professionals attended. The conference programs also provided an in-depth coverage of the current and future livestock industry, highlighting specific areas of growth as well as the latest technology developments. Next, ILDEX Vietnam will occur from 14-16 March 2018 at Saigon Exhibition and Convention Center (SECC), in Ho Chi Minh City. To reserve a space and get the special rate, please contact ILDEX@vnuexhibitionsap.com. The 20 Dutch Exhibiting experts welcome you to talk about the Vietnamese Poultry and Swine production opportunities. This offers you an excellent personal occasion to meet new people and relations. Located booth numbers F6 and F4. This area is located front area of the exhibition hall. Do you want to meet one of the participating Dutch experts at ILDEX Vietnam? Or just catch up with an existing business relation? Dutch experts supporting your business! Let’s start the first step to open the international platform with us!! ILDEX Vietnam 2016 offers visitors an opportunity to hear and learn in detail the background to some exciting new technologies during the three-day exhibition. 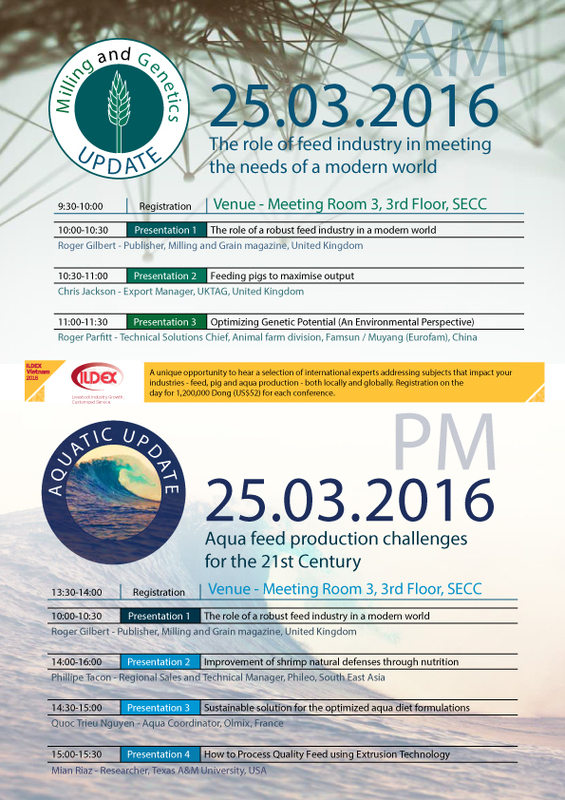 Two half-day conferences will be held on March 25, 2016, one on Milling and Genetics and the other on Aquaculture. The Milling and genetic conference will present presentations which will look at the global feed industry and its role in meeting the needs of a modern industry followed by two presentations on pig genetic developments and pig farm management. Mr. Roger Gilbert, with a background in global feed industry, and after serving 22 years as the secretary general of the International Feed Industry Federation and as publisher of the oldest milling magazine still in print – Milling and Grain – will present his views on livestock feeding and what the future holds for feed manufacturers in a world where feed is still not considered central to safe and affordable food production. He will be followed by Mr. Chris Jackson the export manager for the British Pig Association who will trace the genetic development of the major breeds and how genetic improvement has assisted farmers in reducing their costs of production while improving meat quality. Mr. Jackson is the winner of the VIV Asia ‘Pig Personality of the Year Award 2014’ and is widely respected expert on pig genetics throughout Asia. Mr. Roger Parfitt is the technical solutions chief for Famsun’s animal farm division and will be reviewing pig farming and management systems where modern equipment plays a vital role. The Milling and Genetic Update Conference will begin at 10:00 in Meeting Room 3 on the third floor of the SECC in Saigon on Friday March 25, 2016. 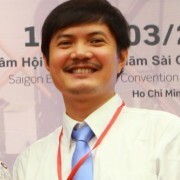 There is onsite registration of 1,200,000 Vietnamese Dong (US$52). The second half-day conference is on aquaculture and is called ‘The Aquatic Review Conference 2016’. It will begin at 13:30 and finish at 15:30. Mr. Roger Gilbert will continue from his morning session and address aqua feed production, looking at the issues it faces in the 21st Century. He is also the publisher of International Aquafeed magazine. Two other presentations will bring nutrition and processing to the attention of delegates. Quick Trieu Nguyen, the aquaculture coordinator of Olmx, a French company specialized in algae products for the industry and strongly represented in Vietnam, will look at ‘Sustainable solutions for optimizing aquatic diets’ This is a must-hear presentation as it is now common knowledge that the industry is actively moving away from fishmeal inclusion and this presentation will look at what’s involved in seeking alternatives. The final speaker of the day is the globally-renowned Dr. Mian Riaz from Texas A&M University who will address the topic of ‘How to process quality feed using extrusion technology for aqua feeds. Dr. Riaz is the Director of Food Protein R&D Center, Head of Extrusion Technology Program and graduate faculty in the Food Science and Technology Program at Texas A&M University, USA. He has published five books, 20 chapters and more than 100 papers on extrusion and other related topics. Three of his books are in the area of extrusion, Extruders in Food Application, Extruders and Expanders in Pet Food, Aquatic and Livestock Feeds and Extrusion Problem Solved. Dr. Riaz is a frequent speaker at international and national conferences and meetings and so far he has delivered more than 200 presentations in 52 countries. Every year he organizes four courses in the area of extrusion. He has been with the Texas A&M system for 18 years. He also has a teaching appointment in the Nutrition and Food Science Department. On Friday March 25, 2016. 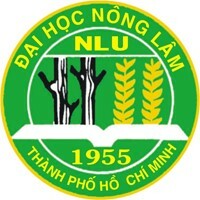 There is onsite registration of 1,200,000 Vietnamese Dong (US$52).